My high school athletic director was a crusty old baseball coach who patrolled the gym giving out unsolicited tips and life advice. I don’t remember exactly how I responded but, since I was a well spoken teenager, it must have been something like “Uuuh… I don’t know”. “Well, you want to make the Varsity Lacrosse team this year, right?” He said. In his own way, it was great advice. Doing curls might make my pencil thin arms earn their keep in the armholes of my t-shirt, but they wouldn’t help me run faster, jump higher, or do anything I needed to make the Varsity Lacrosse team. If you want better results (i.e. more profit), focus on activities that impact your bottom line instead of doing things that might make you look good (i.e. 15 year old Austin doing bicep curls). Simple right? Problem is, most people think they are doing squats, when they’re actually just doing bicep curls. The ecommerce purchase numbers from last November just came back and the results might surprise you. This is a chart from Custora comparing the top 3 ecommerce marketing channels by revenue this last November. As you can see Organic Search was #1 at 21% of all purchases. Really not much of a surprise here. Organic search fills the need for people searching for something they want to buy. Now let’s look at #2. 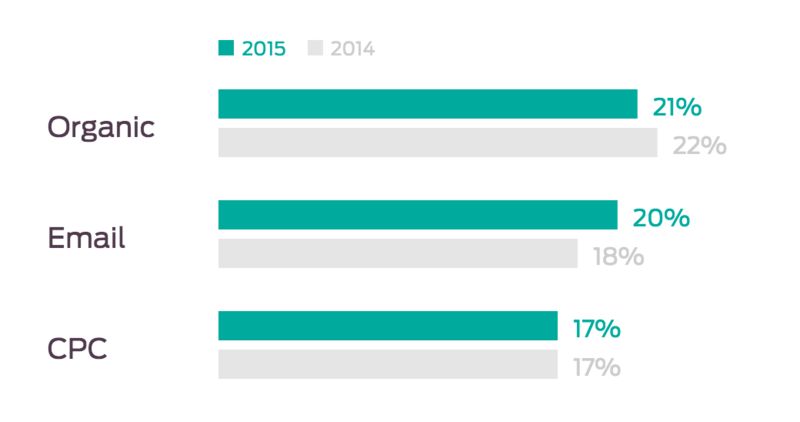 EMAIL MARKETING DROVE 20% OF ALL ECOMMERCE PURCHASES IN NOVEMBER. In a noisy world filled with Facebook, Instagram, Periscope and Snapchat, good old email was the only channel in the top 3 that INCREASED over the last year. Unlike CPC (Cost Per Click, sometimes defined as PPC), email marketing is generally a fixed cost. If I send you 3 (or 5, or 10…) emails this month it costs the same amount as if I send you 1. That, my friend, is a huge advantage. You can’t do that with CPC. If I run 10 Facebook ads and you click on each one of them, I pay 10X more for my marketing. This is why email marketing creates profit. You pay the same amount and get a lot more back. Your profit comes from email. Unfortunately, most businesses think email marketing is like my High School Athletic Director: behind the times, uncool, and tedious. And they might be right, except for one very important fact. Email works. Period. And in 2016 I urge you to take it more seriously. 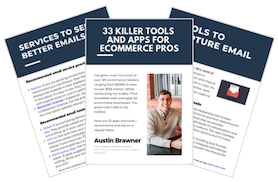 Last year I built email systems for some of the most successful brands in the country, including a company valued at over $100 million dollars. 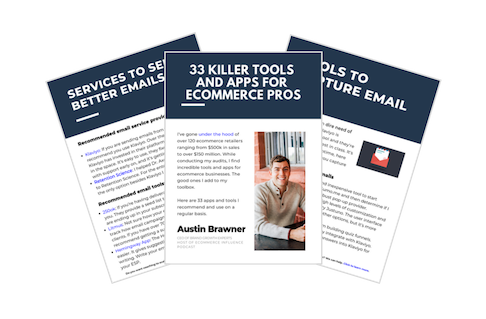 I’ve built email systems that generate tens of thousands of dollars a week in sales, and I’ve written emails that make $5 every time they’re sent. I’m not trying to brag. I just think it’s important for you to know what’s happening with your competition. And if you want to know how to send $5+ emails for your business, I’d like to show you. For the past year the Ecommerce Influence team has quietly been building something new. It’s called the Brand Academy and it’s focused on helping business owners find more profit in their business. If you’re a business owner and you want to grow your bottom line in 2016, email marketing is most likely the place to do it. And if you build your marketing systems correctly, they’ll continue to drive profits for years to come, without you lifting a finger. 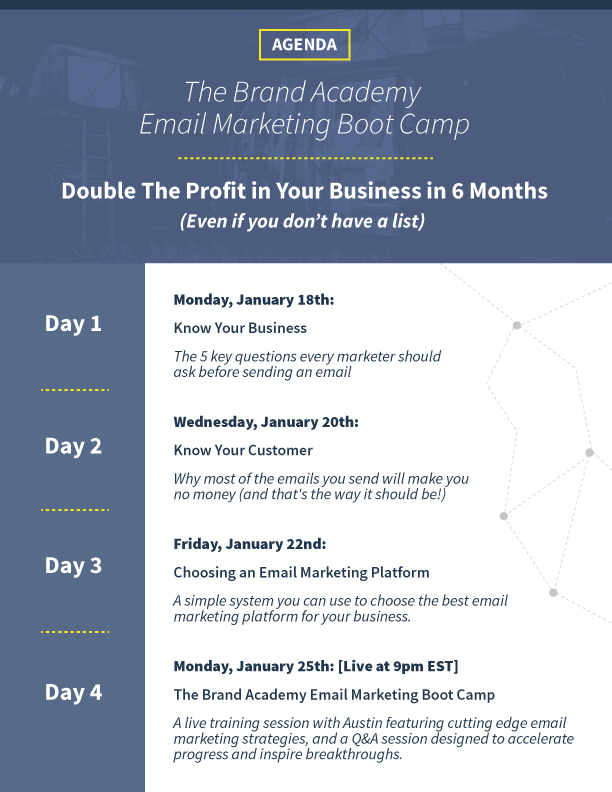 To commemorate our launch, I’m hosting a 4-day Email Marketing Boot Camp where I’ll reveal the email marketing systems and formulas we use with our 7 and 8 figure clients. In this 4-day event I’ll put you on track to double the profit in your business over the next 6 months (even if you don’t have a list). The best part is… it’s 100% free. Check out our agenda for the Boot Camp. EDIT: The boot camp is currently underway and closed to new attendees. If you’d like to be notified when we decide to host it again, please register for free as an Insider. This is a one-time offer to commemorate the launch of the Brand Academy, and seats are limited. Make sure to sign up quickly. I’m relying on word of mouth to spread this event. If you know anyone who’d benefit from this boot camp, please share it with them! Definitely signing up to this. Pumped to have you join Julius. Excited… First time on your blog… I am sure you guys would over deliver it . I have a jewelry store month old…. need to make my next best marketing channel. Infact single most marketing channel to have 10X ROI. Would be great if you help show some of the actionable steps to setup stuff with Klavio.